An aluminum oxide coating for improving the hardness, lubricity and corrosion resistance of aluminum and aluminum alloys. the H20 with Tiolon® (PTFE). The HARDTUF MIL Spec number is MIL-A-63576. This process is an impregnation of PTFE into the unsealed surface asperities of the oxide coating for better lubricity and mold release qualities. This process uses a PTFE coating suspended in a thermoplastic resin and applied by dipping spraying or brushing the unsealed oxide surfaces. This air-dry coating allows for better corrosion resistance and lubricity. In this process, PTFE is suspended in a thermosetting resin, applied by spraying dipping or brushing the unsealed oxide surface and cured at 375°F for one hour. E20 is used for longer wear life and solvent resistance. HARDTUF resists wear and abrasion better than other mil spec type hard anodizing processes. surface tension and greatly increasing lubricity. HARDTUF is more resistant to corrosion and most common chemicals due to the interlocking structure of PTFE and aluminum oxide. Its sealing effect is responsible for excellent salt spray resistance and other corrosion environment tests. HARDTUF is a non-conductor and acts as an insulator. It will withstand a range of 1,000 to 2,000 volts, depending upon its thickness. Standard anodizing films break down at about 600 volts. HARDTUF becomes an integral part of the parent metal. It is the surface of the metal converted to an oxide and then interlocked with PTFE. It will not peel or strip; and because of its hardness, it resists nicks, scratches and will not flake by ordinary means. Machinery-rotors, gears, bushings, bearings, etc. 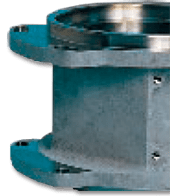 Aerospace components-actuators, valves, impellers, etc. Marine parts-boat spars, fittings, etc. NOTE: Reason for difference in coating quality on die casting is that 218 is 9.4% alloying elements of which the principal is magnesium. Magnesium is not detrimental to HARDTUF and, in fact, there are some high magnesium proprietary sandcasting alloys (such as Almag 35) which anodize very rapidly and well, 360 and 380, however, are 11.60% and 13.80% alloying elements respectively, and the principal elements are silicon and copper. Both, but specifically silicon, are detrimental to a good anodic coating. Most common: 1100 only Bronze-grey in color at .002 inch, alloy is soft and not particularly good for machining. Maximum practical coating thickness .0025 inch. Most common: 2014, 2017, 2024, 2618 (forgings). Avoid sharp corners on 2011 and 2017; grey-black at .002 inch to blue-grey at .002 inch. Excellent machining coating .002 inch; .0025 inch possible for salvage though not as hard as less heavy coats. Most common: 3003. Good for die work and machining. Grey-black in color at maximum coating of .002 inch. 5052 not good for die work, except black. Both have good machining characteristics, Maximum practical coating .002 inch. 5052 has excellent dielectric properties when coated to .002 inch. Most common: 6061 6063 and 7075. 6061 forms excellent hardcoat for grinding, lapping or honing. Excellent dimensional stability. 6063 used for extrusions. Maximum practical coating .0025 inch. 7075 for high strength applications. Reynolds and Alcoa make high stability tool plate (wrought and cast, respectively). Both can be HARDTUF coated. Maximum practical coating is .0025 inch. Most common: 319, 355, 356, also 40E, Ternalloy, Tenzalloy and a variety of proprietary alloys. 356-T6 is used most often. Grinds and polishes very well. Porosity can cause apparent pits in coating. Anodize will not fill in pores. Maximum practical coating .004 inch. Most common: 218, 360, 380. Only 218 produces hardcoat comparable to that on wrought or sandcast, 218 is difficult to die cast. Maximum .0015 inch. 360, 380 maximum about 001 inch. Color is black. Not as wear resistant as 218.